Here at Lent Madness, we take seriously our commitment to answer the bags and bags of viewer mail that we receive each day. Following St. Nicholas’ defeat at the hands of Evelyn Underhill on Friday, one letter in particular caught our eye and we thought we’d share it with you. I am 8 years old. Some of my little friends say there is no Saint Nicholas. Papa says, “If you see it on www.lentmadness.org, it’s so.” Please tell me the truth, is there a Saint Nicholas? Your little friends are wrong. They have been affected by the skepticism of a pre-Lent Madness age. Like a saint named Thomas who once doubted Jesus’ resurrection (and then lost to Enmegahbowh), they do not believe except what they see. They think that nothing can be which is not comprehensible by their little minds. All minds, Virginia, whether they be a great intellectual’s like St. Jerome (who was responsible for translating Scripture into Latin in the edition known as the Vulgate and will soon be facing off against Philander Chase in the Round of the Saintly Sixteen) or a child’s, are little. 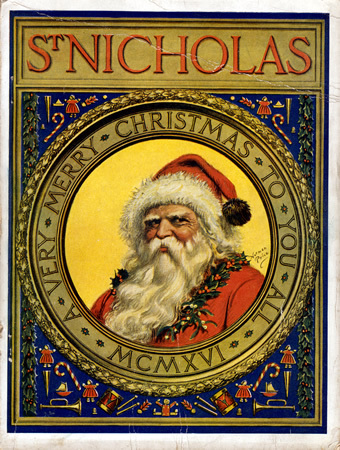 Yes, Virginia, there is a Saint Nicholas. Even though he somehow lost to Evelyn Underhill in the first round of Lent Madness, he exists as certainly as love and generosity and devotion exist. Alas! 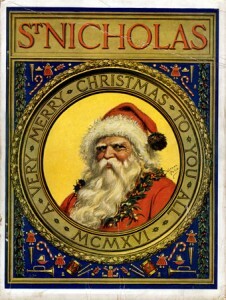 how dreary would be the world if there were no Saint Nicholas! It would be as dreary as if there were no Virginias or Lent Madness. Not believe in Saint Nicholas! You might as well not believe in Dietrich Bonhoeffer or Thomas Cranmer or the Supreme Executive Committee of Lent Madness. Nobody sees Saint Nicholas, but that is no sign that there is no Saint Nicholas. The most real things in the world are those that neither children nor adults can see. Did you ever see Scott and Tim filming “Monday Madness?” Of course not, but that’s no proof that they only exist inside your computer. No Saint Nicholas! Thank God he lives and lives forever. A thousand years from now, Virginia, nay 10 times 10,000 years from now, he will continue to make glad the heart of children who participate in Lent Madness. Even if he likely would have lost to St. Margaret of Scotland in the next round. PS. Good luck with your weekend case of LMW (Lent Madness Withdrawal) and know that voting resumes tomorrow at 8:00 am with Rose of Lima battling Brigid of Kildare. 15 Comments to "Yes, Virginia, there is a St. Nicholas"
ROFL. I was just telling my mother about Lent Madness. She has attended either a Catholic or Episcopal church all of her life and has never heard of some the “winners”. I was getting ready to send her the URL when I stopped by the page & saw this. What fun this has been. Looking forward to another week. What a lovely letter! Poor little Virginia to have to listen to doubters. I felt bad not voting for St Nicholas, I really did. Against anyone but Underhill and he’d have had my vote. Can’t wait for next week’s match ups. And nuts to anyone who isn’t taking this seriously. What a great article! And so original! The Supreme Council is without parallel in their creativity and, and yes, sense of humor. Seriously, do you put something special in the communion wine or is it just the moving of the spirits? Well done SEC! I was suffering from LMW, but, after reading this, no more! Love it! Very well done my priestly duo! Waiting on Monday for your return…it s really been a LMW weekend!! Somehow knowing Lent Madness will return makes Monday mornings a little brighter! Apparently St. Nicholas sleigh did not reach the required 88 miles per hour, to advance into the future round. If he’d only bothered to double-check the flux capacitor. Ah well. Too late now. What… St.Nicolas was bested by some tea drinking lady in sensible shoes! It’s MADNESS I tell you MADNESS!!! On another note, Excellent letter to Virginia, I bow before the all knowing wisdom of the Supreme Executive Committee and I thank them for such a great laugh on this early Daylight Savings time Monday Morning. As one who does Santa and St. Nicholas and has for years, I would say that more wonderful acts of giving and kindness have resulted from the legacy of St. Nicholas than from any other halo contestants. A shame that Madison Avenue has so corrupted the saint. What curmudgeonous cretin could even THINK to put thumbs down on St. Nick? Hello everybody please visit the “Nicholas of Myra: The Story Of Saint Nicholas” Official Fan Page https://www.facebook.com/#!/NicholasOfMyraMovie May God Bless all of you!